Our leading design printer can turn your ideas into physical useful objects such as Cups, Cases, Replacement Parts, Toys, Handles, Mobile Phones, Chess Pieces, Models – almost anything you can think of. 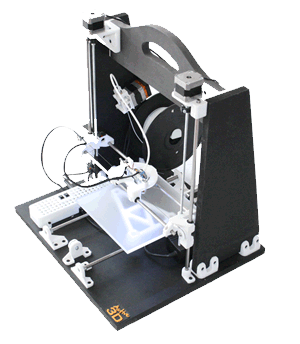 We have full step by step instructions on how to assemble the printer or if you prefer we can assemble it for you. (additional cost involved). You will need basic tools to assemble the printer, but If you don’t have them, we can also supply these. Our technical support team, who are also part of the design team, know these printers inside & out so can also offer support over the phone should you really be stuck. To say they ‘print’ is a hard concept to understand until you see one in action. When you have previously printed items they are in 2D, eg printing a letter , it has a width and height. With 3D printing we also have depth, so imaging your current 2D printer printing the same letter over and over onto the same piece of paper. If the ink were to dry before each next print cycle, the text on the letter would eventually get thicker and thicker turning into some kind of 3D letter. That’s what 3D printing is, except using other materials than ink such as plastic, wood & metal. The Active 3D printer layers up plastic to form a solid object. It melts its plastic filament, then draws with it in a very fine layer. It then builds another layer of plastic on top, then another, and another, building your design in levels from the bottom up until you have a plastic object ready to hold and use.